Interesting bit about issues transferring ThankYou Points to Air France/KLM Flying Blue. I just transferred some yesterday and it took no more than 5 minutes. Hopefully, this means Citi and Air France have fixed any issues. Wow, that’s rough. It only takes 1 day for thank you points to reach EVA mileagelands. 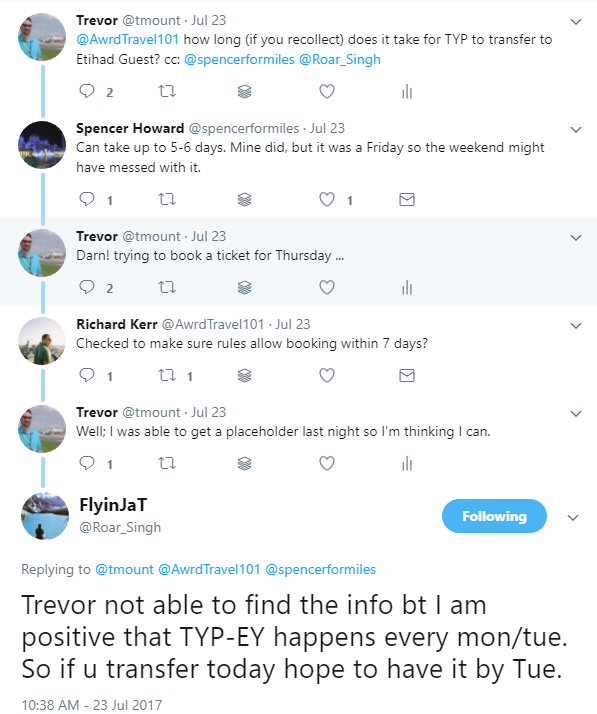 Trevor – I checked my past few transfers and they all deposited on a Tuesday but my last transfer didn’t and still in pending status (initiated on 8/2). May be something changed between Citi & EY. Hi Trevor, I am not running into this issue. Initiated transfer on 12/23, and as of today 1/7/18, still no miles. Called Citi, they said Etihad hasn’t accepted the points…ok then. Did you have to make any calls to inquire about your miles? Thanks for your help! @Tyler – it tooks a heck of a long time for me, however I didn’t need to call in or put in a ticket for the transfer to successfully happen. Thanks Travis! I ended up calling and they opened a case. My points appeared today – not sure if the case really helped or it’s just the normal time frame now. Thanks again for your response!